Eight new trainers are now qualified to teach the “Workplace Integrity” curriculum to news organizations nationwide. On Jan. 17, the Freedom Forum Institute’s Power Shift Project graduated a class of eight new trainers who are now prepared to teach a one-of-a-kind training curriculum to news organizations nationwide. This was the fourth group of trainers who have completed the “Workplace Integrity” workshop and who are qualified to facilitate the unique training in their own organizations. Thanks to a grant from CBS Corp., qualified applicants receive underwritten tuition and travel support to attend the workshops. Applications are accepted from individuals in the news industry and related journalism educational organizations who will deliver the training in their own organizations. The “Workplace Integrity” curriculum is designed to create and promote workplaces free of harassment, discrimination and incivility, and full of opportunity, especially for those who have traditionally been denied it. It was developed by Jill Geisler, who conducts leadership, training and coaching in newsrooms around the world. She is the Freedom Forum Institute Fellow in Women’s Leadership and Loyola University Chicago’s Bill Plante Chair in Leadership and Media Integrity. More than traditional anti-harassment training, this curriculum offers media organizations the opportunity to build stronger, healthier organizations. The interactive curriculum uses critical thinking, creative role playing and group exercises to teach ways to proactively prevent sexual harassment and misconduct and the behaviors that can lead to it, such as incivility and bullying. But more than that, this unique approach sets the table for candid conversations about working in productive and creative cultures of respect, and seeing the world through others’ eyes in an open-minded atmosphere of trust. 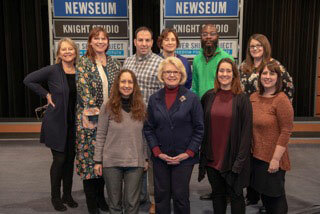 Over a two-day workshop held at the Newseum, participants experience the “Workplace Integrity” curriculum, learn how to teach it and get a complete teaching kit to take back home. By teaching the curriculum to organizations that do not have their own training resources or would like to expand them, these recently graduated trainers will aid in upgrading the culture of their own newsrooms. These trainers will go on to enhance the cause of eliminating harassment and discrimination and building opportunities for people to grow in media organizations across the country. The Power Shift Project has planned five “Workplace Integrity: Train the Trainers” workshops to be held in 2019. Upcoming workshop dates are March 26-27 and June 12-13 at the Newseum in Washington, D.C. Additional regional workshops will be held at Santa Clara (Calif.) University on August 15-16 and Loyola University Chicago on Oct. 16-17. For more information and to apply, visit our training page. If you can’t attend a workshop, The Freedom Forum Institute’s Power Shift Project also offers expert trainers who can deliver this exclusive curriculum to management and staff in the newsroom and beyond. A “Go Team” of qualified journalists and facilitators have completed the Workplace Integrity “Train the Trainers” course and are available to deliver this one-of-a-kind curriculum. The Power Shift Project is an industry-wide initiative to improve the quality and future of journalism by creating safer, more equal and diverse newsrooms. The resources and programs of the Power Shift Project are designed for leaders, human resources professionals, educators, employees and interns. For more information, visit powershiftproject.org. This entry was posted in News and tagged Power Shift, Power Shift Project, Train, Workplace Integrity by Power Shift Project. Bookmark the permalink.